"Lots of Cool Ariel party ideas and more!" Read through our Mermaid Ariel birthday party ideas and incorporate the best birthday party ideas into your party. To make this cool Mermaid Ariel birthday party invitation idea, you will need to use empty water bottles with caps or corks. Make an invitation using your computer! Roll the invitation up and secure it with a raffia bow and put it in the bottle. Add some sand and shells into the bottle. You can mail the bottles with a label on the outside. "Join us under the sea for a Little Mermaid adventure! Our little Mermaid is turning eight! "name" is invited to the fun in the sea! The Party will be held "date and time" to "time" at "location". To RSVP please call "number" by "date". Only Mermaids will be accepted into the sea, so dress appropriately!" Let your princess wear a Mermaid Ariel birthday party costume and ask guests to dress up as mermaids. The main colours for this Mermaid Ariel birthday party are different shades of blue. Hang lots of Mermaid Ariel balloons all over the party area. Put lots of blue balloons on the floor- to create the sea. Use blue streamer to decorate windows and doorways, so it looks like waterfalls. Hang lots of blue tulle, and blue wave decoration. Put blue lights around doorways and decorate the glass doors with fish clings. Cut out lots of fishes from craft foam and stapled them onto the wall, fireplace and over all the furniture. Hang fishnets from the ceiling. If you are having the party at night, hang coloured Christmas lights, (covered with netting). Put big shells all over the house and a shell shape soap in the bathroom. Put stuffed sea animals around the party room and Little Mermaid Ariel posters on the walls. If you have a yard, rent a bubble machine to create sea bubbles around the yard. Use a blue table cloth and decorated the table with shells and a mini-wood chests filled with plastic pearls, chocolate gold coins and sea shells. Use cups, plates, napkins, etc with Ariel's face on. For a centrepiece, place a large glass fish bowl with a couple of small fishes swimming around. Go to our Birthday Crafts section and print out our Crown template. Cut out crowns before the party. Invite the girls to decorate their own crowns with glitter, gems, crayons and glue stickers. Invite the kids to make a seashell souvenir. Provide the kids with small shells, pearls, and glitter glue. 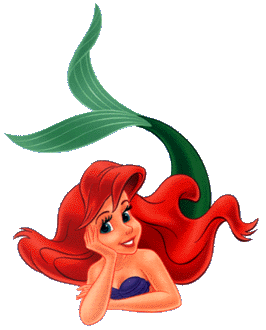 Invite guest to colour some Mermaid Ariel clipart, while they wait for other guest to arrive. Provide guest with crayons and glitter. We have a whole section dedicated to Ariel birthday party games. If the activities and games below are not enough then please click away to our Mermaid Ariel party games. Before the party make a treasure map with your computer. Place different Ariel related items (plastic shells, Ariel figures, etc), around the house and let the kids find them. Make fishing pole out of a stick with a magnet on the end. Let the kids catch a fish made out of paper with magnets on the back, in a mini pool. Whatever number the fish has on their back, that's how many candies the kids get. Divide the children into two teams. Place equal number of goldfish shaped crackers in two shallow containers and place them 15 to 20 feet from the teams. Give each team a spoon. One at a time the children have to run to the container, pick up a goldfish with the spoon, return to their group, drop the goldfish into the empty container and hand the spoon to the next runner. The fastest team, wins! Lots of fun and the kids love to blow bubbles. Finish the party off with a Mermaid Ariel piñata. Fill the piñata with small Mermaid Ariel items and with lots of gold coins and other candy. We have lots of yummy Mermaid Ariel birthday party ideas for food and drinks, have a look below. Fish Shaped Sandwiches: Do this with the help of a fish cookie cutter. Mermaid Ariel Cupcakes: Get some Mermaid Ariel clipart and glue it onto toothpicks, let it dry. Afterwards, stick the Mermaid Ariel on the top of each cupcake. Or just frost the cupcakes with blue frosting, like the sea! Tuna Salad: Serve tuna salad with seashell pasta. Serve the chips and the shrimp cocktail in giant seashell bowls. To make this Mermaid Ariel birthday party cake you need to buy a Mermaid Ariel shaped pan. Put the Ariel cake on top of a sheet cake, and fill it with icing. If you want something more fancy ask the local bakery to print and sell you the tranfer paper of a Mermaid Ariel picture, then you can outline and fill it with icing. Fill the sheet cake with blue icing- the water and put sea shells all the way around the outside of the cake. Fill your Mermaid Ariel birthday party bags with goldfish snack bag, sea shells, a container of bubbles with a bubble wand, a squirt gun, lip gloss, glitter bracelets, fish and Mermaid Ariel stickers, plastic fish and lots of fish looking candy. Buy blue mini lunch bags and stick Mermaid Ariel stickers to the bag and you will have a Ariel birthday party bag. Take lots of pictures in the Mermaid Ariel birthday party. Afterwards scan the pictures into your computer, put sea border around it. After printing them out, put a little flower on the back of the thank you note. Lastly, get them laminated and give them away to everyone that came. Something more easy? Just write a thank you note from your computer with sea border around it and send the pictures you took of the guests to them via email, (as an attachment)! I hope our Mermaid Ariel birthday party ideas will help you in your planning and I hope your princess will love and enjoy her Mermaid Ariel birthday party.